The controversy over what to do with the 3.5-mile long abandoned northern section of the defunct LIRR Rockaway Line between Ozone Park and Rego Park has once again made it into a major newspaper, in this case in an article in the New York Times about a week ago. In that article we learned that the state will be awarding a $500,000 grant to the Trust for Public Land to study the QueensWay proposal to turn the abandoned railroad right-of-way into a linear park and biking/walking trail. It is rather curious that no equivalent grant is being made to the groups – and such people and groups do exist – advocating that the line should be resurrected as a – hold your hats - rail line. An extension of the "R" subway line, in fact. The advocates for the Greenway insist that the revived line would accomplish little and that few people would ride. Oh really – a line that parallels the heavily trafficked Woodhaven Boulevard corridor – a line that would provide a one seat connection from densely settled Queens neighborhoods like Rego Park, Jackson Heights, Woodside, Astoria and Long Island City to East and West Midtown, that would provide possible transfer connections to the IND "A" and BMT "J" lines, and that would also serve neighborhoods of moderate density in central Queens that have no heavy rail access at this time – no one’s going to ride it? Furthermore the Greenway crowd says that reviving the line would be too costly. Yes much work would be needed to get it back up and running. But as compared to constructing a wholly new rail line the cost of getting the defunct line back in working order would be a genuine bargain, probably around one tenth the cost of new construction. The Woodhaven Junction station. Photo: John Chevier / Flickr. Many people have argued that the line should be reactivated as a branch of the Long Island Rail Road. This would be better than a greenway, but not as good as a connection to the Queens Boulevard subway line. The capacity of the Queens Boulevard line is determined by a combination of signaling along each of its four tracks and by its terminal capacity, i.e. the ability of the terminal stations, 71-Continental Avenue-Forest Hills, 179th Street and Parsons/Archer to process or relay arriving and departing trains. The express tracks are, happily, operating at the current design capacity of 30 trains per hour. Unfortunately the local tracks, while also theoretically capable of 30 trains per hour, are presently only running at about 20 trains per hour in the peak period. This is necessitated by the terminal at 71-Continental, which can only turn around about 20 trains per hour at the limit, and that not very well. For this reason the 63rd St connection to Queens Boulevard required a "robbing from Peter to pay Paul" switcheroo: the "G" line had to be cut back to Court Square and its slots on Queens Boulevard given over to another, Manhattan oriented service, first to the "V", and now to the "M". (For the first few years the “G” line ran to and from Forest Hills nights and weekends, when there was no "V" train service. But this passenger friendly part-time service died to make weekend service changes more doable). Of course it needn’t be that way. Even in the original MTA plans from the late ‘60s "G" service would have remained intact. The express by-pass alone would have insured this. This is where the old LIRR Rock Line comes into play. By connecting this line to the Queens Boulevard line east (subway north) of 63rd Drive station – the tunnel bell mouths are there specifically for that scenario – the path to another local service terminal would be created, i.e. now the "G", along with the "M" and "R" could run along the Queens Boulevard local tracks, with one of these service branching off after 63rd Drive and heading off to a new terminal at either Howard Beach or, it would be hoped, JFK, and thus not threatening to overwhelm 71-Continental as a terminal. In this way peak trains per hour on the Queens Boulevard local tracks could be raised from the present day 20 trains per hour up to 27 ½ trains per hour, given the current timetables on those three lines. This would be a significant improvement in service, especially if the "G" were equipped with full length trains. These are the transit advantages of reactivating the Rockaway Branch as a subway line. 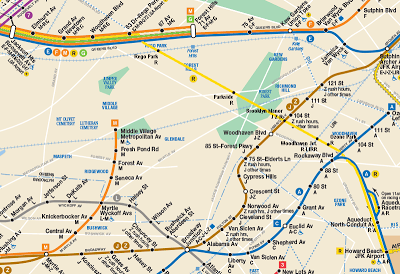 Neighborhoods like Woodhaven, Rego Park and Ozone Park get quicker service to Midtown. Greenpoint and Williamsburg can be reconnected to Astoria and Jackson Heights with revived G train service. 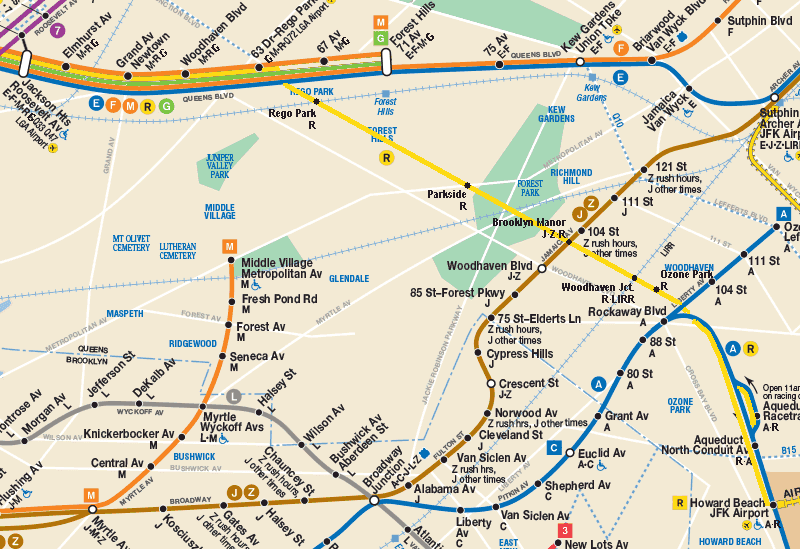 Local stations on the Queens Boulevard line see seven more trains an hour. These benefits are worth the money. This is something we can do. If you agree, sign our petition to Governor Cuomo and be counted. Capt Subway is a Queens resident and transit advocate with 37 years of experience working for the New York City Transit Authority, including Senior Schedule Manager. He has had his alias for at least as long as I've had mine. What's limiting the turnback capacity of the Forest Hills terminus? There are two turnback tracks past the station, which ought to be a pretty optimal turnback arrangement in terms of raw capacity. Is it the fact that they have to check every train to make sure it's really empty, and that takes time? Is it something about the layout of the turnback or the restricted speed through the crossovers? The Moscow Metro manages to turn back 39 trains per hour with a similar track layout, so what's stopping NYCT from doing the same? Arcady, it's the the checking for people on the trains that slows it down. If they didn't do it for trains returning to service, they could increase capacity. That being said, some idiot would sue for waking up on a train making a relay and losing 30 seconds of his/her life. There are in fact four relay tracks downstairs. But, yes, it is, in part, the need to clean out (of passengers) every single train upon its arrival before it can proceed into the relay. Rest assured 20 TPH is pretty much the limit here. 20 TPH is a 3 minute headway. Given a replacement time in the station of 1 to 1 & 1/2 minutes this only leaves a maximum of 1 & 1/2 minutes to clean out the train. The seemingly excessive replacement time is due to the fact that trains are not allowed, by rule, to "key-by" red automatics and close in on their leaders. Also - another IMHO rule - a train cannot enter a station until its leader has fully vacated the station. As an experiment go out to 71-Cont and stop-watch each move. You'd be amazed at how quickly the seconds & minutes pass. As to how they do it in Moscow? I have no idea what their rules & regulations are. Plus I'd have to see the layout of the plant where they're turning 39 TPH. Yes indeed AlexC - there were a number of incidents in years past involving passengers left on relay trains. There was one case where a woman was raped by some perv; other incidents where Train Operators or Conductors were attacked by demented homeless types, etc, etc. Then, after 9/11, the whole terrorist angle got added into the mix - the fear that some guy was going to ride the train into the relay position and then blow the place up. Hence the current SOP. Let me add that some, not a lot of the problem is simply sloppy operation: the Dispatcher in charge lost track of who's supposed to make the next move; the guy who's supposed to relay the train is upstairs in the bathroom, etc, etc. In a situation where every second counts there simply is no room for error, or for wasting time. Hrmm, I thought I read that this line was open cut? Is some of it open cut and some of it surface? The reason I ask is because for any part thats an open cut, it may be possible to cover it (it certainly would be if they were building a new cut-and-cover tunnel) and put a park over it. Thus the Queensway people could get their park, and the park might actually be accessible thanks to nearby R stations. IIRC that alignment is mostly elevated. It's actually an intuitive alignment for heavy-rail service, and I don't know why such wasn't extended there back in the '50s or whenever they extended the A train down the latter portion of this alignment. Moscow has advanced speed control on some lines, which allows it to run 39 tph. Moscow has classical automated block with stop arms on two lines, rest of the system has cab signalling with speed control and no wayside signals (except for home signals). Moscow metro has different signaling and controlling systems on different lines. Line 3 & 4: block system with manual control and automatic emergency stop (since it was built in 1930s-1950s). Line 2, 5, 6, 7 & 11: block system with lights and automatic speed control, OPTO (Line 5, 6 & 7 built in 1950s-1970s; Line 2 & 11 changed signaling at the end of 1970s). Line 1, 8, 9 & 10: block system with different block lengths, no lights and automatic speed control, OPTO (Line 8, 9 & 10 built in 1980s-1990s; Line 1 changed signaling in 2002). In 1914, the Third Ave El was reported to have intervals of 45 seconds. It had two termini: City Hall and South Ferry. Both were twin track termini with bumper blocks. BTW, it shared the South Ferry terminal with the Second Ave El which was reported to have intervals of 2 minutes. That's a total of 110 tph to be shared by two termini. At least one of them had to beat 36 tph. A little bit more about Moscow: there are two primary kinds of signal systems in use, with most lines now having cab signals (with or without waysides) on a simple system with about 4 speed codes, while some lines still have an older system based exclusively on wayside signals with train stops, which is quite similar to what is used by NYCT. I don't know as much about the system as I do about the one in NYC, but I do know that there is no such thing as key-by, and there are no signals inside a station, so it's impossible for a train to enter a station until its leader is out of the station. I also know that the regulations call for checking all trains at the last stop. The standard layout is similar to Broad Street on the J but with an island platform. You can go look at all the details on the track schematic. The standard operation has the new train operator board the rear of the train before it goes into the turnback, and the old operator get off after it comes back out. I believe one or both of them assist in checking the train, and checking trains is pretty fast with a an all-longitudinal seating layout without much space under the seat, which makes it pretty hard to hide anything in the car. The thing about the track map is that, while many of the termini seem to have 4 relay tracks, there don't seem to be any switches between the outer 2 tracks, so any train entering one of the outer tracks would have to reverse back into the station on the same track. A quibble: The argument for running subway trains on this route, like the R train, seems compelling. But the linked petition speaks only of extending the LIRR, and I'm not convinced. 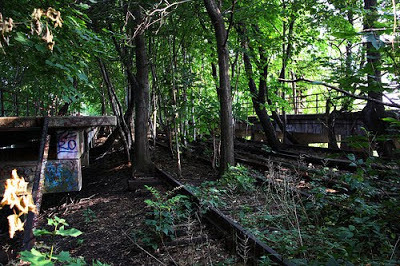 I would absolutely like to see the Rockaway Beach branch be restored for subway service. I’m just not so sure the R is the right choice for the service. Neither are the E or F, because both of those services are heavily used and riders from those lines would raise hell if they lose them. The G would not be good either because it runs infrequently and it would require everyone to transfer for Manhattan. I think the M would be the best option. The M is not a perfect solution (that would be a Queens super express, but good luck getting that built). It’s local and cannot run full-length, 600-foot trains. But it does serves Midtown Manhattan directly, has good transfers and serves major destinations in Manhattan. And while the R serves Times Square and Union Square directly, it takes longer to get there because the R goes west before it goes east. The M runs a straighter route in Manhattan, so it’s faster to Herald Square and not too far from Times or Union. M service can be expanded to serve the Rockaway/Queens Blvd line and 6th Avenue during weekends and late nights. This is a no brainer as a subway extension. The ROW is there, it brings good transit to underserved areas, it alleviates congestion at an existing terminal... what's not to like? It's a little disheartening to see the grant go to TPL. Yeah, an advocacy organization born out of Marin's hyper-NIMBYism... wonder how that one is going to turn out. We shouldn't reactivate it immediately, and don't connect it to the R at all. There should be more options, because Rockaway riders aren't gonna want a local service. I'd reactivate the line tomorrow, if I could! It's better to have a local line than to have no line at all. Does your transit line need more riders? Does your transit trip take too long?